A scenic drive through Ontario County will provide a relaxed, rural and hometown feel with a bit of big-city vibe to round out the pleasure. Rich arts and entertainment, mouth-watering gastronomy, historic and local hot-spots are around every corner. Located towards the western side of the region, Ontario County has two cities – Canandaigua and Geneva – and four Finger Lakes – Canadice, Honeoye, Canandaigua and a bit of Seneca. The 17th-century Seneca Nation “peace town” of Ganondagan is now a destination filled with five centuries of art, culture and Native American history. Explore the Ganondagan State Historic Site’s replica bark longhouse and learn about the history and culture of the Seneca and Haudenosaunee (Iroquois) people at the interactive Seneca Art & Culture Center. In Bloomfield, the Antique Wireless Museum shares the intriguing story of communicative technology – from the first telegraph to the world’s first operating cellphone. Tasty treats are abundant in Ontario County – from pure maple syrup in March to the county’s most talked about fall dessert, grape pies. (And you won’t want to miss the Naples Grape Festival in September – a two-day celebration of all things grape!) Take a gastronomic journey at New York Kitchen as you explore the culinary and agricultural bounty of New York State. Or pull up one of 14 seats at FLX Table, the cozy restaurant named the country’s best new restaurant in 2017 by USA Today. The multiple-course meal changes seasonally and often, with a wide selection of local beers and wines to compliment. It is located on Linden Street in Geneva – a popular night-life spot with unique wine and cocktail bars. 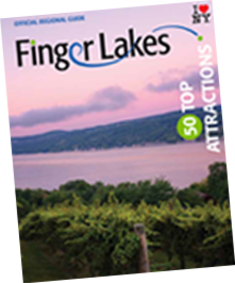 Libation lovers won’t go thirsty with the Canandaigua Lake Wine Trail and Rochester/Finger Lakes Craft Beverage Trail to sip your way through. Ontario County has over 250 miles of hiking, biking and water trails, making it the perfect place to get outdoors and explore. When it comes to skiing and snowboarding, Bristol Mountain, has 138 acres of skiable terrain – and the highest vertical (at 1200 feet) between the Adirondacks and Rocky Mountains! Bristol Harbor Resort has a championship 18-hole golf course along with its gourmet restaurant. If being pampered is more your style, check in to the Belhurst Castle to enjoy spa treatments, fine dining and a winery – all without having to leave the property!